Fuji Excursion - JR Pass Eligible? Hi, I noticed there is a new Fuji Excursion train that goes straight to Mt Fuji. 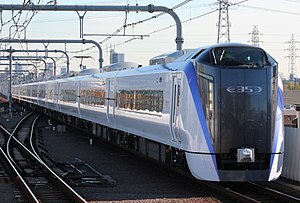 It is operated by JR and another company. Does anybody know if you can take the Fuji Excursion train with a JR Pass? I did a quick Google and found that no, you can’t! Sorry! I’m guess they made this train for travelers and want to make money on it. It’s a train operated jointly by JR and the Fujikyuko Railway. As far as I understand, that means you can use your JR Pass for part of it, but will have to pay in the difference when the line switches over to the Fujikyuko section. To be sure, I suggest asking at a JR ticket office at Shinjuku Station.